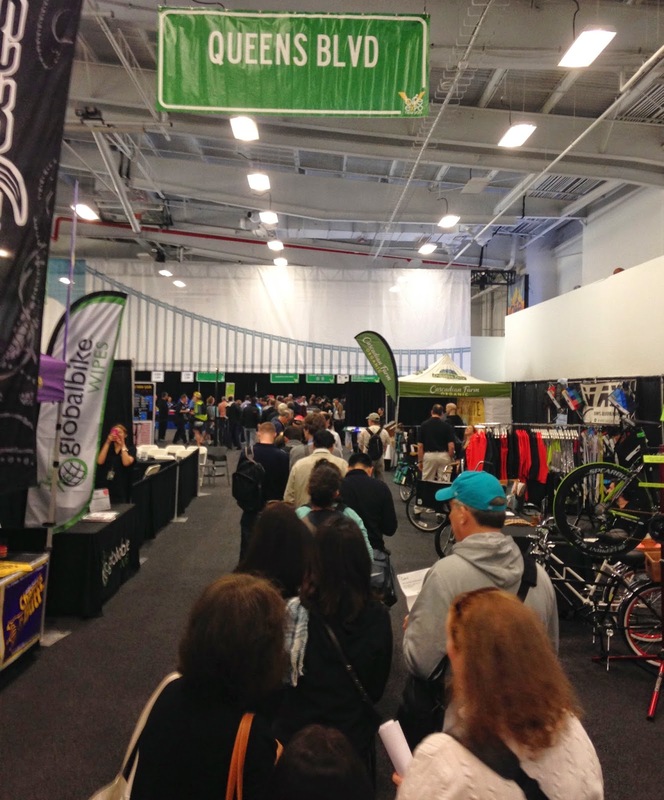 Because I don't need to travel far to go to New York City I was easily able to go to Bike Expo New York 2014 this morning. It's open for the rest of the day today and all day tomorrow so whether you are a Five Boro Bike Tour participant or not, I hope you have a chance to go. 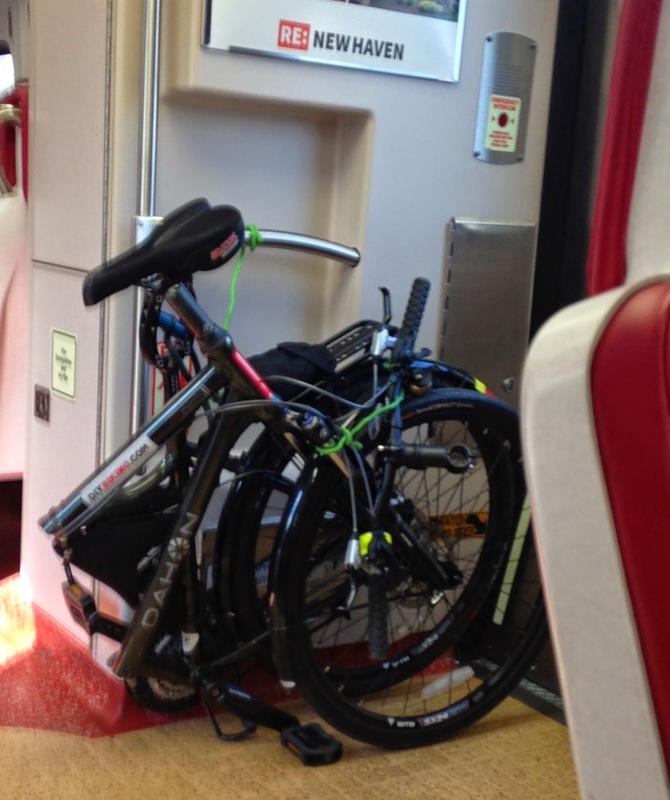 My morning started by riding my Dahon Matrix/favorite loophole for getting around Metro North's ridiculous peak train anti-bike rules/I-can't-believe-Dahon-discontinued-it to the Stamford station to go to Grand Central. After riding to Pier 36, I left my bike with the valet service provided by Transportation Alternatives and fell into line just as the expo opened at 10:00. Moments after entering the building, I was presented with this view. It's my own fault since I usually arrive early enough to wait in the line getting in but this was my first time waiting in line inside. About a half hour after this photo was taken I got my packet. I got to chat with a nice woman in line behind me and and each Bike New York volunteer was polite and professional, but something still niggled me. This isn't a terrific view, but as you can see a lot of Bike New York volunteers aren't serving riders…who are mostly in the foreground in the common line. As you can see from the table, riders of a certain number are instructed to fall in a specific line…after already waiting in the common line. 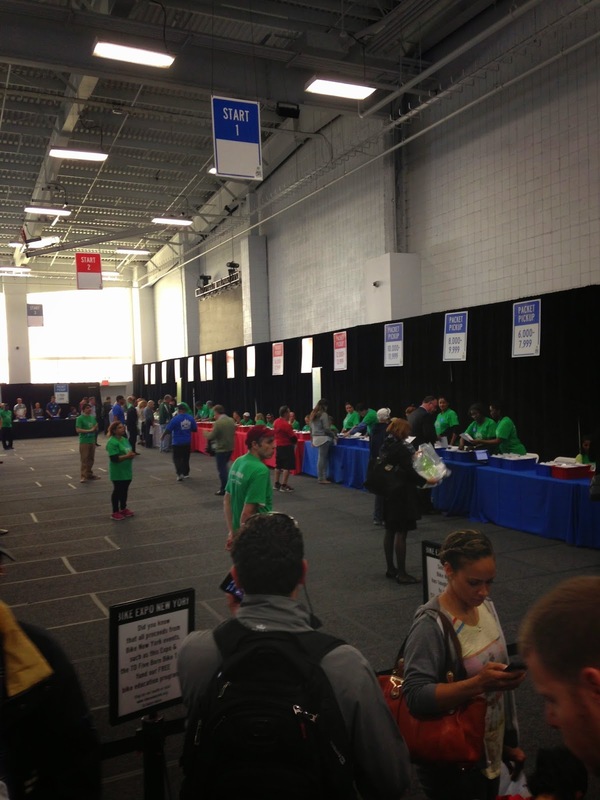 I could not understand why we weren't instructed to fall in line according to our rider number since they could have had the laptops where they enter the names on the same table as the people looking into plastic boxes for our rider numbers. But that operations management annoyance/suggestion for next year vanished quickly when I stuffed my rider packet into my backpack and hit the expo floor. One of the first things I noticed was classroom-looking area that looked like a place one would learn how to balance the federal budget deficit or change a tire. Another entertaining area was the REI booth which promised to make a donation to Bike New York in exchange for pedaling a mile on a bike set up on a trainer. 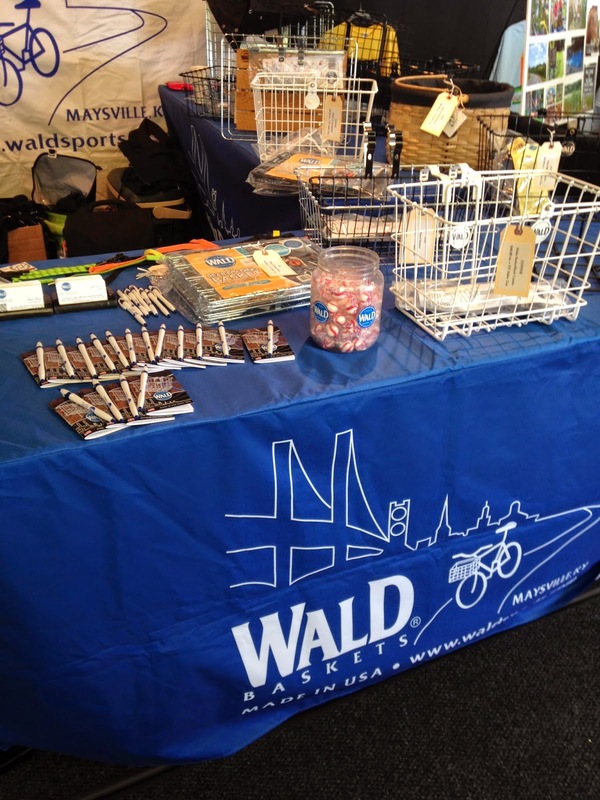 It was good to see some old friends like Vaya Bags, who I again assumed would do a good business during the show to supply people who needed their bike bags to be Five Boro Bike Tour Compliant. 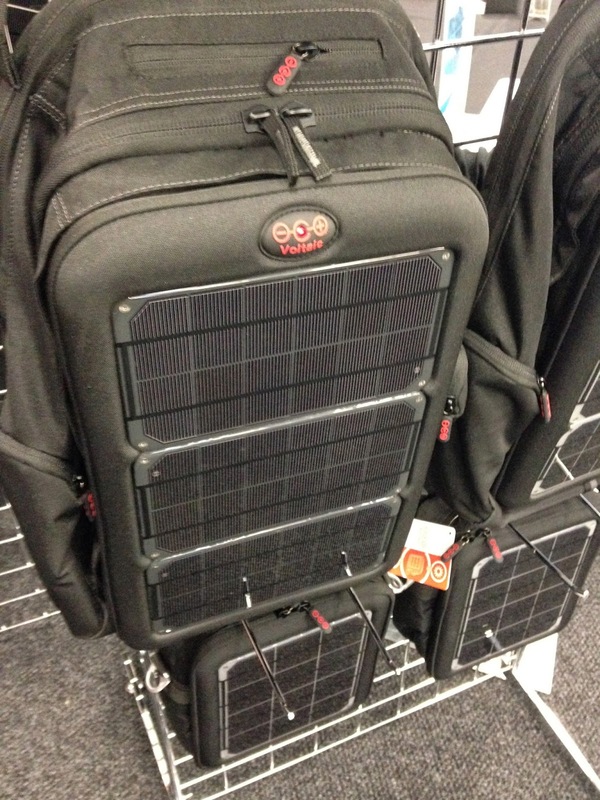 Some of the bags from a new vendor (new to me), Voltaic Systems, sells some pretty interesting solar chargers and while some of the bags looked very non-Five Boro Bike Tour compliant they did look like they meant business. Tempted to use their 20% off coupon, I am. As I said in my review of Bike New York's weird bag rules earlier this week, baskets are back in this year. Some can be found at Wald Baskets. These are sturdy, American-made baskets and they even make a wide, low basket that can accommodate a pizza. Another new presence is Vespertine, who makes fashionable cycling clothes that are shockingly reflective without forcing the cyclist to dress like a yellow highlighter. I could completely picture Lucius Fox describing it to Bruce Wayne: "Looks like a shirt…but…shine a light on it…"
How I wished I had known of them before writing the DIYBIKING.COM Essential Guide to Staying Safe While Riding at Night feature. It was good to see Brooklyn shop Rolling Orange Bikes again since some of their Dutch cargo bikes inspired my tribute to the cargo bike last fall. 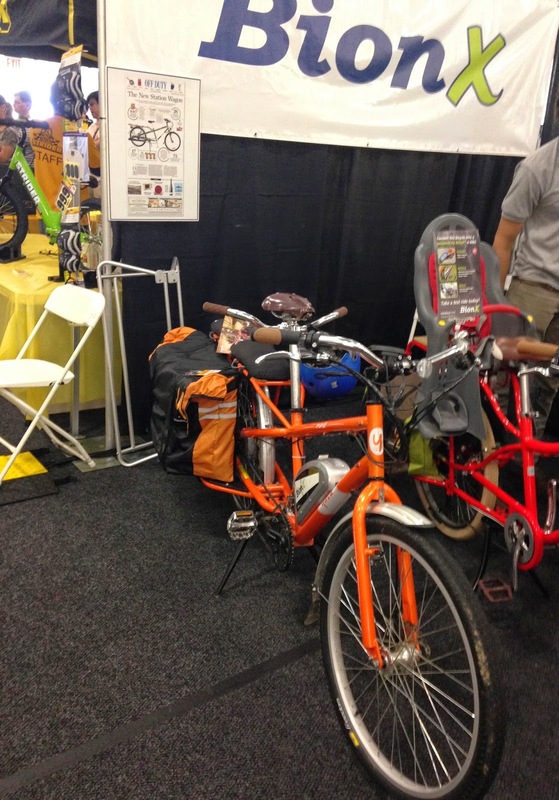 Another source of inspiration, found at another booth, was The Yuba Mundo - and this one features a BionX electric drive. I also met the editor-in-chief of Momentum Magazine, Mia. I hope you can get to their booth and talk with her briefly before walking off with a copy of the May/June issue since it's nice to read her Editor's Note, Why I Love Riding to Work, and feel like you're hearing her read it to you instead of you reading it. The May/June issue is also notable since Meg, one of the founders of Bike Stamford (who organized an outstanding ride last fall) is featured on page 63 also talking about why she enjoys riding to work. Speaking of riding to work: May is National Bike Month and Bike to Work Week is May 12 - 16th with Bike to Work Day on May 16th. If you are in Connecticut and want to organize a Bike to Work Day event please visit Bike Walk Connecticut and register your event and find some bike to work resources. I'm going to work on my bike tomorrow and make sure it'll take me through my tenth Five Boro Bike Tour on Sunday. Whether you've done more tours than me or this will be your first one, have a great time and I'll see you at the start line or along the route. 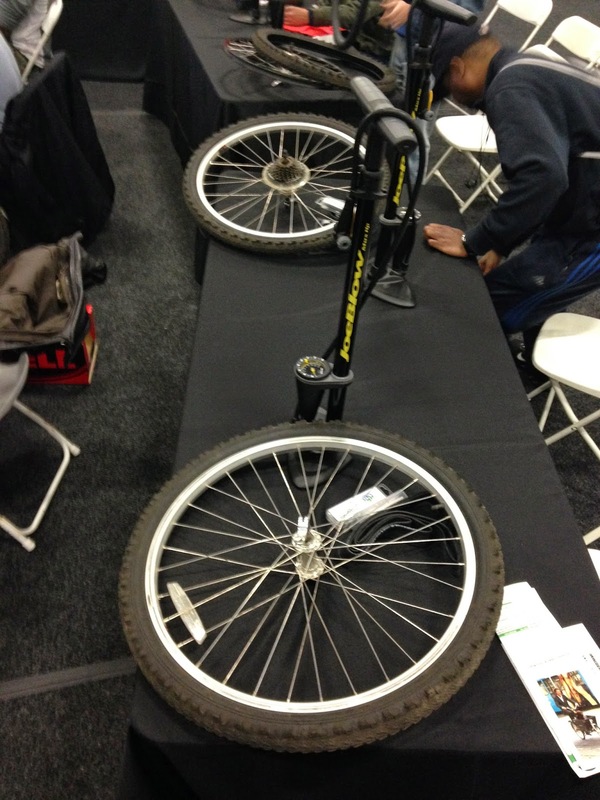 In the meantime, enjoy Bike Expo New York. Thanks for reading and thanks for riding.